Open Library claims to have 6 million authors and 20 million books (not works), and about one million public domain books available as digitized books. Tens of thousands of modern books were made available from four and then 150 libraries and publishers for ebook digital lending. Other books including in-print and in-copyright books have been scanned from copies in library collections, library discards, and donations, and are also being distributed in digital form. ^ "Openlibrary.org Traffic, Demographics and Competitors - Alexa". Alexa Internet. Retrieved 2019-03-19. ^ a b "openlibrary/LICENSE at master · internetarchive/openlibrary · GitHub". Github.com. Archived from the original on 2017-01-22. Retrieved 2015-06-26. ^ a b "A library bigger than any building". BBC News. 2007-07-31. Archived from the original on 2009-11-27. Retrieved 2010-07-06. ^ a b c Grossman, Wendy M (2009-01-22). "Why you can't find a library book in your search engine". The Guardian. London. Archived from the original on 2014-01-14. Retrieved 2010-07-06. ^ "Aaron Swartz: howtoget". Aaronsw.jottit.com. Archived from the original on 2015-05-23. Retrieved 2015-06-05. ^ a b c OpenLibrary.org. "The Open Library Team | Open Library". openlibrary.org. Retrieved 2018-07-16. ^ "About Us". Openlibrary.org. Archived from the original on 2015-06-27. Retrieved 2015-06-26. ^ Fowler, Geoffrey A. (2010-06-29). "Libraries Have a Novel Idea - WSJ". Online.wsj.com. Archived from the original on 2016-10-28. Retrieved 2015-06-26. ^ "Internet Archive Forums: In-Library eBook Lending Program Launched". Archive.org. 2011-02-22. Retrieved 2015-06-26. ^ "FAQ on Controlled Digital Lending (CDL)". Retrieved 14 February 2019. ^ "George". Openlibrary.org. Retrieved 2015-06-26. ^ Oates, George (2010-03-17). 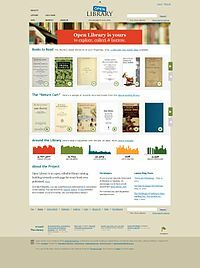 "Announcing the Open Library redesign « The Open Library Blog". Blog.openlibrary.org. Archived from the original on 2015-06-27. Retrieved 2015-06-26. ^ "internetarchive/openlibrary · GitHub". Github.com. Archived from the original on 2015-08-10. Retrieved 2015-06-26. ^ "About the Technology". Openlibrary.org. Archived from the original on 2015-06-27. Retrieved 2015-06-26. ^ "Developers / Licensing". Openlibrary.org. Archived from the original on 2015-06-27. Retrieved 2015-06-26. ^ "Project puts 1M books online for blind, dyslexic | UTSanDiego.com". Signonsandiego.com. 2010-05-05. Archived from the original on 2011-12-17. Retrieved 2015-06-26. ^ "Welcome to Daisy Books for the Print Disabled". Internet Archive. Retrieved 10 December 2012. ^ "NLS Factsheets: Copyright Law Amendment, 1996: PL 104-197". Library of Congress NLS Factsheets. Library of Congress. Archived from the original on 2017-05-21. ^ Scheid, Maria. "Copyright and Accessibility". Copyright Corner. The Ohio State University Libraries. Archived from the original on 2016-06-30. ^ "Controlled Digital Lending (CDL): An appeal to readers and librarians from the victims of CDL". Retrieved 14 February 2019. Meadows, Chris. "The Internet Archive's OpenLibrary project violates copyright, the Authors Guild warns". TeleRead. This page was last edited on 6 April 2019, at 05:59 (UTC).